Attracted by the smell of honeydew, this tiny midge lays its eggs in colonies and the predatory larvae (shown) attack the aphid prey. 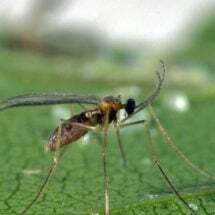 Attracted by the smell of honeydew, this tiny gall-midge attacks pest colonies. 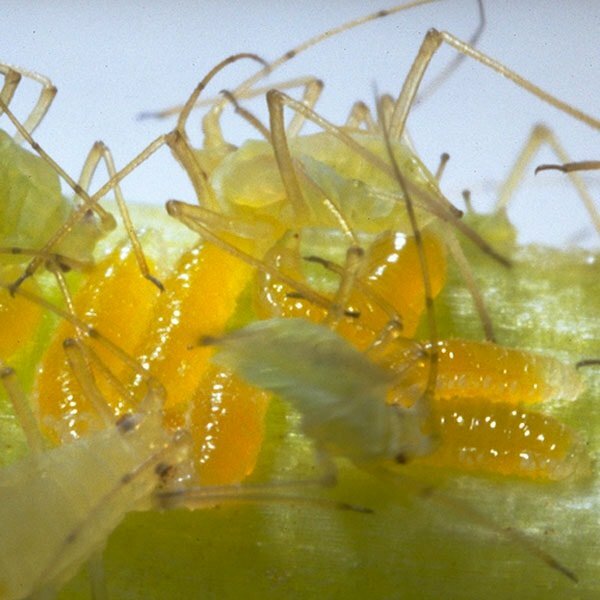 In its larval stages, Aphidoletes aphidimyza is a voracious aphid killer. 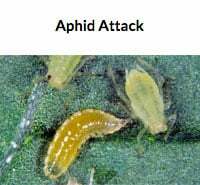 The more aphids present, the more it will consume. 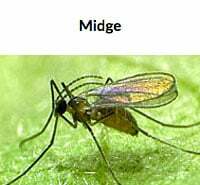 Also known as the gall midge, it’s known to feed on some 60 types of aphids. It’s a popular means of aphid control in greenhouses. Shop our large selection of beneficial insects, including aphid predators, at Planet Natural. One bottle — 2,000 gall midges — treats up to 10,000 square feet and costs $134.95 with UPS Express shipping included! 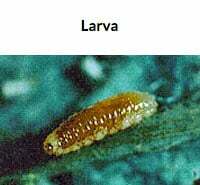 Basically night feeders, the larvae hide on the undersides of leaves during the day. In its adult midge stage, the delicate fly feeds on aphid honey dew and deposits eggs in aphid colonies. The larvae take two-three days to hatch and go through three stages over two weeks, feeding on aphids as they go. The predator spends its pupal stage in the ground. The adult emerges in one to two weeks to lay more eggs among the remaining aphids. Gently turn and shake the bottle to mix the contents. Place the bottle on the soil or hang in between plants. To protect against ants do not scatter the contents. Repeat weekly for a minimum of three weeks. Note: Each 100 ml bottle contains black pupae mixed with vermiculite, from which 2,000 gall-midges hatch.